"Ginger adds a very nice layer of flavor and perks up basic candied carrots for a side that the whole family will love!" Bring carrots and water to a boil in a saucepan, reduce heat to low, and simmer until the carrots are tender, about 10 minutes. 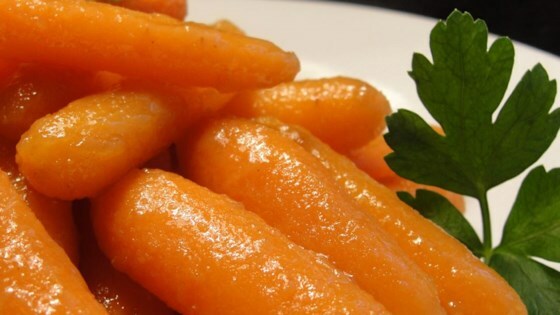 Drain carrots; stir in butter until carrots are coated. Stir in brown sugar, ginger, and salt; bring to a boil, and cook the carrots, stirring often, until the carrots are glazed, 2 to 3 minutes. Delicious! I used Splenda brown sugar blend instead (measure half as much), and it was wonderful. I will make it again and again. Sorry, I felt the ginger was too over powering. We just didn't care for these. I'm sure it's our taste and has no reflection on the recipe since others who rated this really liked. I added some chopped pecans to it, it was delicious!! These were really good. I served them with adobo chicken and a green salad. Very good and easy. That's what I like about the whole thing.